Mother Nature smiled on us again this year and the weather was absolutely beautiful! Visitors and locals alike showed up to enjoy the day and it appeared that a good time was had by all. Thank you so much to all the many folks who make the day possible. it wouldn’t be worth doing if people didn’t show up to play so thank you to everybody who attended, sponsored, provided entertainment, put up a booth or in any way helped make this all happen again this year. But most of all, thank you to the many, many volunteers who help plan and organize the event, show up to work a shift or two or three on the day of the event, or just jump in when they see a need. Between the Business Association’s volunteers, the Fire Department’s volunteers, the Sheriff’s Volunteers and all the other small groups who participate, we need about 150 volunteers on the day of the event and this community always comes through. Thank you again for all your time and enthusiasm. 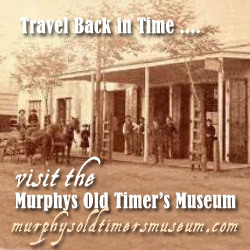 It’s you who are helping the vendors and visitors and making sure they see how wonderful a place Murphys is. A special thank you to Ironstone Vineyards who provided free event parking and shared in the cost of the shuttle so we could get people back and forth again this year. Make sure to watch their concert schedule and plan to come back and see a show this summer. New shows are being added all the time. 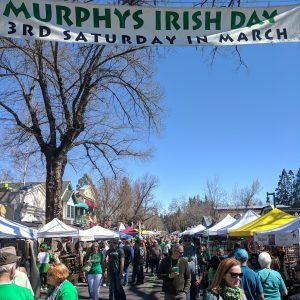 Mark you calendars now for our 2020 Murphys Irish Day celebration which will take place on Saturday, March 21, 2020.